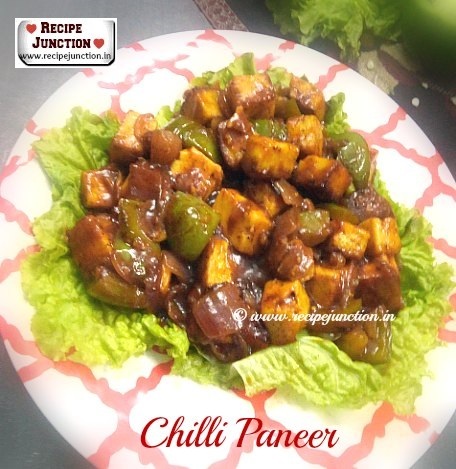 This hot and spicy chilli paneer is a delicious treat itself. Serve it as a starter or as a side dish with Chinese rice or noodles, it's a popular item in restaurants too. I make this at home quite often and also order it in restaurants too, but whenever I order any Indo-chinese dish in restaurants, I specially mention not to add MSG, do you also do that? If not, please do so, as there is a ton of controversy surrounding MSG in the natural health community. It is claimed to cause asthma, headaches, and even brain damage. On the other hand, most mainstream sources (like the FDA) claim that MSG is safe. But I prefer to be safe than sorry. So I make my chinese food at home or order at restaurants without MSG. MSG is short for monosodium glutamate. It is a common food additive that is used to enhance flavor and without this also one can make a delicious Indo-Chinese dish. 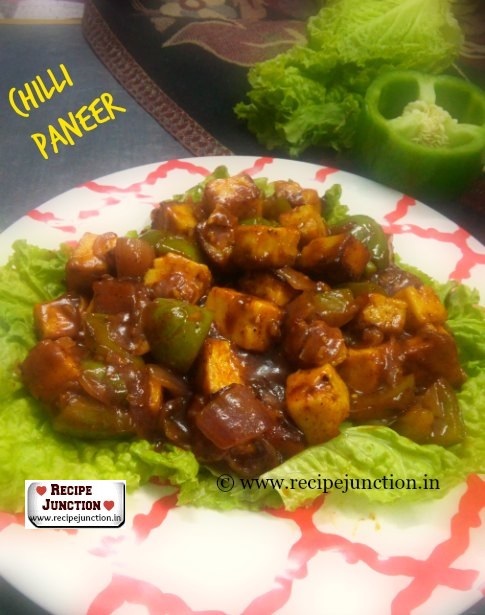 For making chilli paneer, the paneer pieces are needed to marinate in cornflour and deep fried. But I prefer to shallow fry them with a little oil. But you can choose your preference, either ways it tastes great. Goes well with Chinese Fried Rice or Chinese Hakka Noodles. Soya Sauce : 2 tblsp. Green chilli sauce : 1 tblsp. 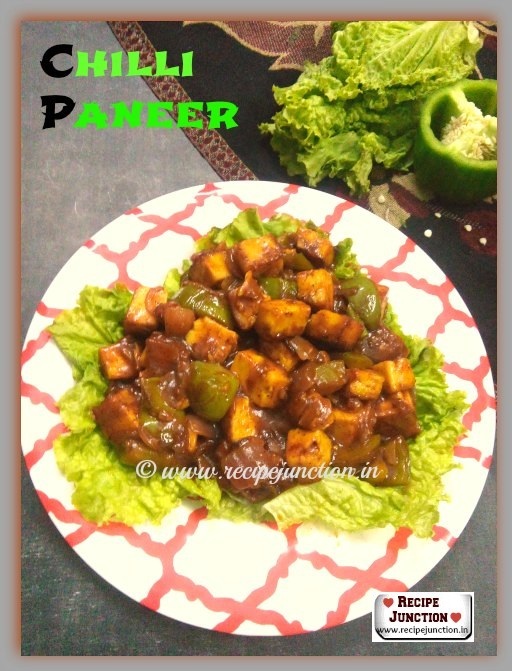 Cut paneer into 1 inch pieces. Marinate the paneer pieces with half of the ginger and garlic, a pinch of salt and black pepper. Heat 2 tblsp. oil on a tawa and fry the paneer pieces in medium flame till they are light brown on both side. Drain on a paper towel. In another small bowl, mix all the sauces and keep aside. Heat 1 tblsp. oil in another pan, add the onion slices and saute till they are translucent. Add capsicum cubes and saute in medium flame. When they start to soften, add rest of the minced ginger-garlic and chopped green chillies. Now add the sauce mixture into the pan. Add a pinch of sugar to balance all the taste. Add the fried paneer pieces into the sauce and saute for a minute or two. Add 1/2 cup of water and cover the pan with lid. Let the paneer pieces soak the sauces for 3-4 minutes. Do not add salt st this time, as all the sauces contain lots of salt. In a small bowl, dissolve 1 tblsp. cornflour in 2-3 tblsp. of water and add to the pan. Check the seasoning, if needed add salt and black pepper according to your taste. Enjoy with Plain rice or roti or even Veg Hakka Noodles or Chinese style fried rice. I have tried with all these combos....goes excellent. Homemade is always the best, looks really delicious.